He doubled for Clark Gable during the burning of Atlanta in "Gone With The Wind." He enjoyed a long-time friendship with John Wayne, whom he taught how to fall off a horse. 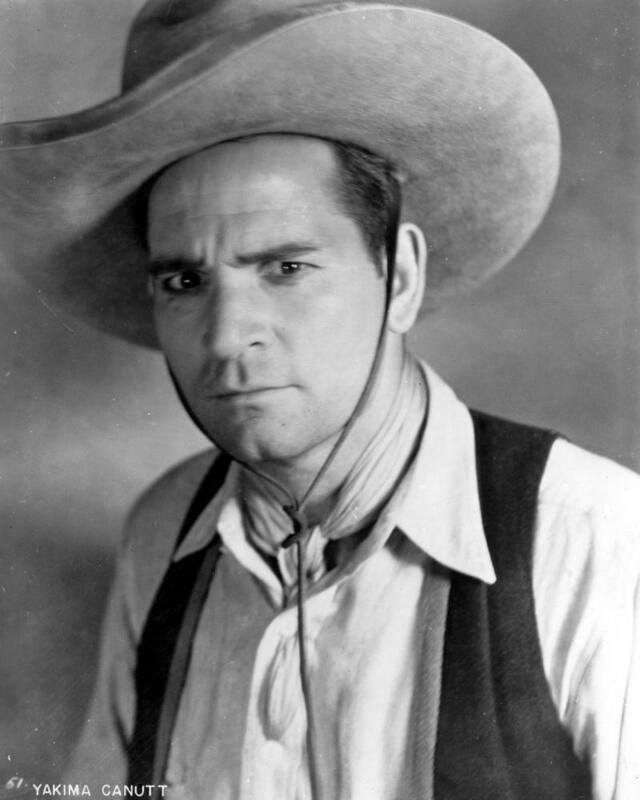 But long before he became one of Hollywood's legendary stunt men, Yakima Canutt had a career in front of the camera. During the silent era, "Yak" starred in a series of Westerns that featured his expertise in horsemanship, trick riding, and rodeo skills. We'll show two of his surviving features, 'Branded a Bandit' (1924) and 'The Iron Rider' (1926), on Sunday, July 30 at 4:30 p.m. at the Wilton (N.H.) Town Hall Theatre. It's the latest installment of our summer-long "Birth of the Western" series. And no series about the origins of Hollywood westerns would be complete without Yakima Canutt. Both of the films we're showing are classic fare—the kind of fast-paced adventure film that Hollywood was learning to crank out in quantity to keep theaters filled and audiences happy. It's also an interesting look at a figure who would be influential in years to come. In his early on-camera days, Canutt was just as daring as anyone, risking life and limb to get just the right shot. "It was in Branded a Bandit (1924) that his nose was broken in a 12-foot fall from a cliff. The picture was delayed several weeks, and when it resumed, Canutt's close shots were from the side. A plastic surgeon reset the nose, which healed, inspiring Canutt to remark that he thought it looked better." But later, he used his hard-won experience to stage stunts that were no less spectacular, but which minimized the risks faced by performers. His long career included work on Golden Age blockbusters such as 'Ben Hur' (1959) and 'El Cid' (1961), and in Walt Disney productions such as 'The Swiss Family Robinson' (1960), one of the most memorable films of my early childhood. Canutt remained active in the business into his 80s, his last credit being 'Equus' in 1977. But his influence could still be seen on the big screen. 'Raiders of the Lost Ark' (1981), for example, contains a specific tribute to Canutt's work. It was while working on Mascot serials that Canutt practiced and perfected his most famous stunts, including the drop from a stagecoach that he would employ in John Ford's 1939 Stagecoach. That famous stunt in Stagecoach was filmed near Chimney Rock on Rabbit Dry Lake, west of Lucerne Valley, California. He first did it in Riders of the Dawn in 1937 while doubling for Jack Randall. In his 1981 film Raiders of the Lost Ark, Steven Spielberg paid homage to Canutt, recreating the stunt when stuntman Terry Leonard (doubling for Harrison Ford) 'dropped' from the front of a German transport truck, was dragged underneath (along a prepared trench) and then climbed up the back and round to the front again. Wow! From silent films to 'Raiders.' Pretty impressive! Canutt died in 1986, at age 90. But he'll return to the silver screen on Sunday with two of his starring pictures. See you there—and get ready to cheer on 'Yak' as he rides to the rescue! Does Harold Lloyd's comedy 'Safety Last' (1923) lend itself to the same Dixieland musical treatment as Woody Allen's 1973 film 'Sleeper'? We'll find out. • Last Friday, we enjoyed dinner with Romeo (pronounced "ro MAY oh") Melloni, a composer based here in New Hampshire, and his wife Elizabeth, a well known pianist and accompanist. Much of our conversation was not about music, but about car repairs and home delivery of dishwashers. Yes, this is what musicians talk about when they get together. Did I know the musicians? No. Had we rehearsed? Of course not! 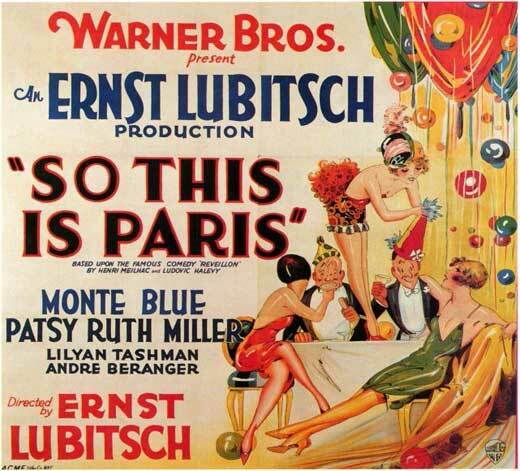 And that same day, I'd then do a live score (solo this time) for the Ernest Lubitsch comedy 'So This Is Paris' (1926) at the Harvard Film Archive. Romeo and Elizabeth both laughed, and Romeo proclaimed that I lead such an interesting life. Little did I know how interesting the weekend would get! • On Saturday, a hot mid-summer day found me on my bike about four miles from home when a towering wall of black clouds appeared in the northwest. I had checked the weather radar before setting out—a line of storms was moving in from the west, but was still far away. The Weather Service did have a storm warning in place, but it wasn't set to start until 2 p.m. I'd be back long before then. It was now 1:30 p.m., and the black wall was coming in fast, already blotting out the mid-day sun. Hadn't Mother Nature checked with the Weather Service? I was pedaling away on what we call "the old Route 3" in Bedford, still figuring the odds of getting home dry, when the first big drops landed. BIG drops: first a few, then more, with the sky quickly darkening further. I was on an incline leading to a bridge over the F.E. Everett Turnpike when the deluge hit. And I could see it coming. Up ahead, gusting winds were blowing heavy rain down onto the road in sheets, actually kicking up dust ahead of it! And boom! It was like riding into a carwash. I was instantly soaked to the skin, and nearly blown off my bike. I pedaled ahead, unable to see due to wind-driven rain blowing straight at me, but aware there was a car behind me with a driver who probably couldn't see anything either. Just then, my cell phone in my backpack started sound a "severe weather" alert alarm. "Yeah, I know," I thought. Another gust nearly toppled me, and then the wind just howled from the northwest, driving rain horizontally. Thunder roared overhead. I was on an exposed highway embankment. I dismounted and held onto the bike to brace myself against the wind, which was making signs do that rapid back-and-forth dance that signs do in bad weather. Instinct kicked in. I had to take cover, so sprinted down the grassy embankment to at least get out of the wind, carrying my bike with me. I found myself near a wooden utility pole, one side of which was still dry thanks to the horizontal rain blasting from one direction. So I maneuvered behind the pole and stood up straight behind it as the wind roared all around, shielding myself from the worst of the rain. Thunder was now cracking and booming all around. (But no lightning.) The powerlines above were being bowed out by the wind, which was causing the pole itself to bend and sway. I kept thinking, "the worse it is, the faster it's over." But this didn't let up for maybe 15 minutes! The wind finally died down enough for me to emerge and begin walking my bike over the bridge. Roads were turned into temporary rivers with the run-off. I eventually got back on the bike, riding it through water-choked streets without regard for the spray it kicked onto me, and completed the ride home. Amazingly, the phone was fine! And the wallet, too. I had somehow folded the bag to keep them relatively dry. Afterwards, I felt great! Part of it was having encountered a frightening and potentially dangerous situation, and coming out of it okay. Another aspect was more mundane: getting totally soaked, I got a shower during my bike ride instead of after it. This felt really refreshing, like I'd just swum in a lake. I should do it more often! 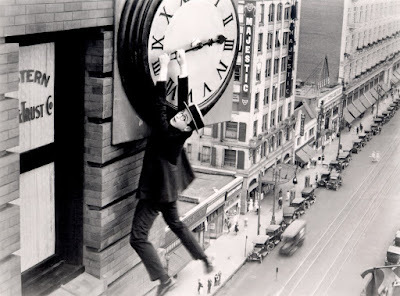 Harold Lloyd in 'Safety Last' (1923): appropriate considering the time pressures we were under. • On Sunday, July 9, I made the hour's drive down to Boston early. I had to set up what would be the only rehearsal to accompany a silent film screening that afternoon at the Somerville Theatre. I would be working with "Sammy D and the Late Risers," a group of Dixieland players joining me to score Harold Lloyd's great comedy 'Safety Last' (1923). All this was arranged months ago, but everyone's schedule is busy, and it worked out that the only time we could all get together was the morning of the show. Thus it was necessary for me to head down early for a Sunday 9 a.m. call for a group with "Late Risers" in its name. Because the Somerville's main theater is rented by a church every Sunday, we had to rehearse in one of the smaller cinemas upstairs. Alas, I found them to be what you'd expect movie theaters to be: except for the exit signs, completely dark. After much fumbling around, I finally called projectionist David Kornfeld, who clued me into where the switch for the cleaning lights is hidden. Still, I got everything arranged. This included mounting a portable TV/DVD player on a wooden chair, which itself was balanced on two purloined trash receptacles. That made it high enough for everyone to see. Ah, the arts! Of the five "Late Risers," three arrived on schedule and began setting up around me. Percussionist Grant Smith, clarinet player Austin Yancey, and tuba player Josiah Reibstein—all had worked together often and I immediately felt at ease. But we couldn't start going through the film just yet because my disc with 'Safety Last' was being brought by a band members who hadn't arrived. After 10 a.m., we decided to go through the cues, which I had inventoried beforehand. - I hoped to create the same kind of feel that Woody Allen had created with Dixieland music in 'Sleeper' (1973). I remember the first time I saw 'Sleeper' (when it was broadcast on TV as the "ABC Movie of the Week" or somesuch when I was a kid) and it all instantly clicked. Long before I ever studied music, I knew this was a perfect match: to me, Dixieland and broad physical comedy were like chocolate and peanut butter. Part of this also grows from my fondness for the much-reviled "Time-Life" editions of Harold's films that circulated in the 1970s. These are acknowledged to be badly edited reissues of Harold's comedies, complete the with goofy theme song "Hooray for Harold Lloyd," by none other than Neal Hefti, composer of the iconic theme for the 1960s "Batman" TV series. But their one saving grace, I think, was the music scoring done by a little-known arranger, Don Hulette, who put together Dixieland tracks that were used for all Harold's features in the 1970s. Here's a sample of the music, which strikes me as just about perfect for so much of silent comedy. Some is raucous, some is sentimental. I could listen to it all day! So that was what I was aiming for with Sammy D and the Late Risers. - The other thing: it was really important that the Dixieland be used where it could help the comedy sequences strut, but that it otherwise keep out of the way of Harold's story and all the emotions it encompasses. One of the great glories of the silent film experience is when an audience gets swept up in gales of laughter. And I've found this doesn't happen automatically or all at once. It's actually often triggered by just a few people who start. They get a few others going, and if this continues, everyone gets freed up to start laughing. And eventually you get landslides and total avalanches of laughter. However, I've observed that this process can be short-circuited. Sometimes, if the music is too loud or too much too soon, it prevents people from hearing that first, crucial laughter in those around them. And if people can't hear others laughing, they themselves don't start laughing. And thus the spontaneous combustion doesn't combust, no matter what funny or amazing things happen on screen. So it's been my practice, especially with comedies, to keep the music as simple and spare as possible to allow the audience to hear itself. Once the laughter starts—well, then you can amp it up and go anywhere. But do too much too soon, and you squelch the laughter before it has a chance to ignite. Thus it was really important to impress upon the Dixieland players that less is often more. I wanted to be careful to give 'Safety Last' every opportunity to do what it was intended to do: to fire up an audience and then take it a roller coaster ride like none other in cinema. As we ran through the cues, the guys seemed to get this instinctively, which was great! What was not great was that the player with the disc was still a no-show, forcing us to work through the music without the movie, which none of the other musicians had ever seen. But even as we reached our noon-time break point, I wasn't concerned. First, there simply wasn't time to be worried—not with having to move all our stuff down into the main theater and set up for the show. Also, I knew the film, and they knew the music, and even without two of the players, we sounded pretty good. Our banjo player, Tev Stevig, arrived after lunch, which had been expected expected. But what about the missing player with the disc? Well, sometime after noon I got a call saying he couldn't make it, but efforts were underway to find a sub. It would be a trombone player, rather than trumpet. Okay. And when was he expected? Probably about 20 minute before the show. Wow! But I have to say, I really didn't mind. Nothing like a little last-minute tension to keep everyone focused. And guys were really that good. And besides, this had to happen when you're working with a band called "The Late Risers." At 1 p.m. in the Somerville's big theater, we had our one chance to play through some cues with the 35mm print running on the screen, to get a sense of what that would be like. Then at 1:30 p.m., it was time to open the house. To my surprise, a hoard of people stampeded in, and kept coming! Among them was our trombone player, Quinn Carson. The band was already playing some warm-up tunes, and Quinn wasted no time in joining in, first with trombone, and then jazzy vocal solos. Here's us before the show. The keyboard player was absent because he was taking the picture. The crowd kept building and so did the energy, as we pushed though a few more tunes, with me joining in where appropriate. And then after an introduction from theater manager Ian Judge, I got to welcome the crowd. Clarinet player Austin Yancey introduced the players, as I was sure I'd forget someone's name. I kept my intro to the film short, and then off we went—first me on keyboard with some open fifths up high, to create a magical atmosphere. Then house lights down. Curtain open, and then cue band for our opening number: Gershwin's 'Fidgety Feet,' which served as the film's theme song and would return several times, including at the very end. We nailed the first set of tight cues: I cut off the band at the opening scene, where it looks like Harold is about to be hanged at a prison. Somber music for strings only from the keyboard. But then the scene abruptly changes to show Harold's actually at a train station about to leave for the big city. Great sight gag that can really be punched up if the music turns at just the right moment, and I counted off so it hit the spot exactly. Yes! And off we went, alternating between band cues and with me at the keyboard, usually just with strings to serve as a contrast to the Dixieland. I was concerned it might be too jarring to shift back and forth like this, especially as the band players were unmiked, but the keyboard was coming through the house sound system. But it all seemed to work. As we went, I felt the band was pushing a little too hard, so I had to keep bringing them down to play quietly, and then amping it back up when a scene called for it. They responded beautifully. And to my delight, I could hear laughter behind me: at first some good solid laughs where you'd expect, such as when Harold and his roommate hide from their landlord underneath their overcoats. As 'Safety Last' progressed, the laughs built and became more solid and consistent. So I felt we were all primed for the film's amazing climax—where Harold has to climb a building. I've been to screenings of 'Safety Last' where the suspense of this sequence has led to audiences literally shrieking en masse as Harold slips, grips, and trips his way up the tower, encountering all manner of obstacles along the way. There's tension, which by itself rivets an audience. But there's a steady procession of gags, which produce laughter energized by the tension. 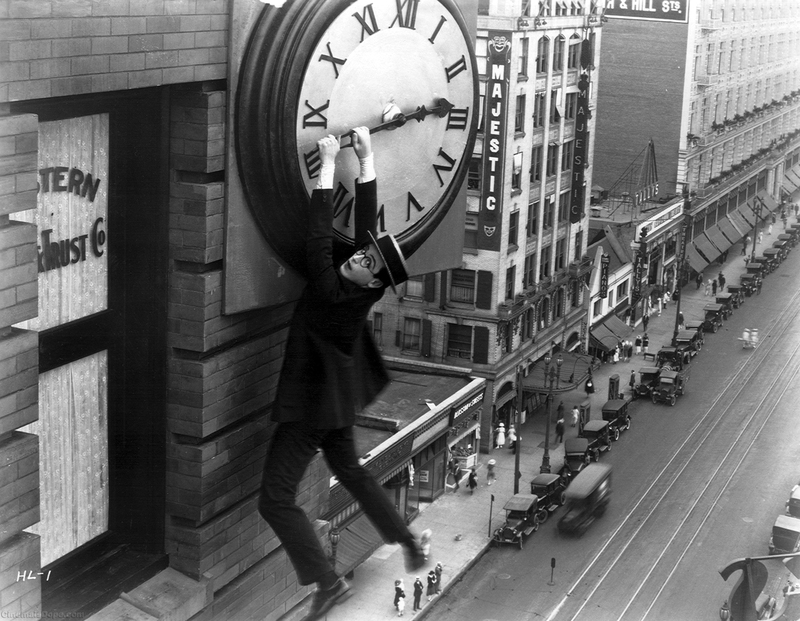 If everything clicks, Harold's building climb is one of the great thrill rides of the cinema, even today. I'm delighted to say it all came together at the Somerville on Sunday. We had it all: laughs, shouts, gasps, cries of "oh no!" and several rounds of applause as Harold cleared various ledges on his way up. This is an unscientific comparison, but the amount of energy released by the audience during the last 15 minutes of 'Safety Last' easily surpassed a day's output of the Seabrook Nuclear Power Plant. At the end, we had one last tricky set of cues to get through: the "love music" when Harold and Mildred embrace, then a reprise of the "drunk" music for one final revisit of a running gag where an inebriated gentleman simply cannot untangle himself from a tennis net, and then back to "Fidgety Feet" as we faded out and went to the end titles. Curtain closed, lights up. And then came a thunderous ovation that reminded me of the storm I'd encountered yesterday! Our audience—which I found out later was the largest ever for the Somerville's "Silents Please!" series—rose to its feet, cheering and shouting. I had the guys stand, and we took several rounds of bows, individually and as a group. Applause continued. To paraphrase Sally Field: they really like us! And "us" means, first and foremost, Harold. His film had done what it's always had the power to do. And I was delighted to think that the music we'd played had somehow helped it work its magic. And I said to myself: this is about as good as it gets! It took awhile for applause to die off to the point where I could say a few closing remarks and thank everyone. And then I felt like Lawrence Welk, counting off the band for some exit music: "And a one, and a two..."
Afterwards, we spoke to so many people who brought kind comments and compliments. What a treat! We were still there more than an hour later, when we had to be reminded that another show was due to start soon. And so the Late Risers and I went our separate ways—for now. I really enjoyed working with them, and I think the approach we took to 'Safety Last' would work well with certain other films, and not necessarily all comedies. We'll see. This was followed by a whole different gig: solo accompaniment for 'So This Is Paris' (1926), the Ernst Lubitsch comedy that celebrates adultery and the Charleston. It was screening at the Harvard Film Archive as part of a summer-long Lubitsch retrospective, and I had agreed to do music long before I thought of how exhausted I'd be after a day playing Dixieland on the cosmic edge. I went into the breech anyway—and to my surprise, I suddenly turned into a combination of Jacques Offenbach and Carl Stalling. Really! I wasn't quite sure what material I'd use for the film, other than the actual "Charleston" tune when that specific dance figured prominently in the picture. But as the first scenes unfolded, I stumbled over one good idea after another, all of which fit the tone and action of what was on the screen. Wow! Before long, I'd settled on a few motives or "melodic cells," and these were enough to carry the rest of the film. It flowed quite easily, and seemed to be geared to punch up the humor. One odd thing is that I was genuinely tired, both physically and mentally. But the music flowed easily, so it felt like fatigue actually worked to "unblock" the place where music comes from. Somehow, my tiredness actually seemed to disable my defenses and self-critical instincts, allowing the music to flow unhindered by the usual sandbars and debris. It was coming so easily, towards the end I felt outside my own body, like a spectator taking it all in, just as surprised as anyone at the music as it unfolded. And what's more, I was pleased with it, which seemed to also help things by acting as positive reinforcement. This kept occurring for most of the film. As 'So This Is Paris' went through its final scenes, I sensed I'd totally nailed the film. And against all expectations, too—I was tired, had come to the theater with no real plan, and my head was full of raucous Dixieland. Plus I had to go to the bathroom! But everything had come together. I ended the score with a well-proportioned flourish, and then was greeted by a generous ovation. Twice in one day! I could get used to this. And so, dear Diary, I must confess to you that I never imagined I'd spend my Sundays like this—making live music for not one but two big silent film screenings in Boston, and to appreciative audiences. I guess I do lead an interesting life, and for that I'm thankful. Ten years ago, if anyone had suggested I'd be doing so much public music, and for so many people, I'd have laughed. I thought that train had long ago left the station. But it turns out I've been at the same station as Harold Lloyd at the beginning of 'Safety Last'—just missing the gallows, and then boarding an ice wagon by mistake before finally getting on the right train after all. And now I'm finally climbing the building. I've just been stuck on the ice wagon for 30 years. An original poster for 'The Lost World' (1925). It's 'The Lost World' tonight, and then a new world of Dixieland this coming Sunday! New to me, anyway, as it's the first time I've collaborated with a Dixieland band in scoring a silent film—or in anything, really! Be that as it may, it's back to making music after a 4th of July weekend break. 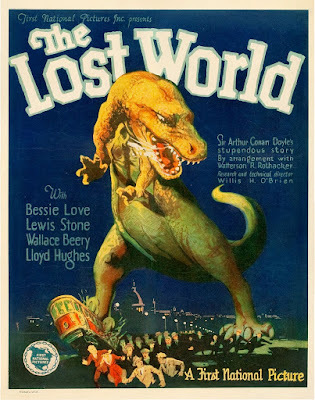 First up is 'The Lost World' (1925), which is running tonight (Thursday, July 6) at the Capitol Theatre in Arlington, Mass. It's the original 'dinosaur' movie—the one that showed the way for filmmakers all the way through Steven Spielberg's 'Jurassic Park' and beyond. Showtime is 8 p.m. We've been getting good crowds at the Capitol silent film series, and it's turning out to be a great place to experience silent film the way it was intended: in a theatre, with live music, and with an audience. And then on Sunday, July 9, the music will take a turn for New Orleans, with a screening of Harold Lloyd's great comedy 'Safety Last' (1923) in 35mm at the Somerville Theatre, 55 Davis Square, Somerville. The show starts at 2 p.m. And with me in the pit will be Sammy D and the Late Risers, a local Dixieland ensemble. I first heard Sammy and the band a few months ago at the Aeronaut Brewery, also in Somerville, when they were jamming prior to one of my Sunday night silent film programs. I've always had a sweet tooth for the classic Dixieland sound—and for a bunch of guys from New England, they seemed to come pretty close! If you'd like to get a sense of their sound, here's a clip of them in action. It's wild, uninhibited stuff and really effective in live performance. And as I listened, it occurred to me that 'Safety Last' was coming up at the Somerville Theatre, and I was looking for a different approach, as we'd run the title a few years ago. I also remembered seeing 'Safety Last' more than 10 years ago at a Boston area venue that will remain nameless. The print had arrived unexpectedly without a recorded soundtrack, and so the theater's solution was to play a CD of Scott Joplin piano rags. There's nothing wrong with Scott Joplin. And 'Safety Last' is one of the great thrill rides of cinema—even today the climax can be a nail-biting and nerve-wracking emotional roller coaster. But two great things don't always go together. And in this case, I was struck how the steady, measured ragtime beat of Joplin's rags totally flattened the film! Rather than amp up the excitement, the music removed all the peaks and valleys, leaving it a cinematic flat tire. Wow! That was one of the reasons I began doing music for film—because, I reasoned, even I could do a better job, and something like that should never be allowed to happen to one of the cinema's great treasures. So how to integrate a Dixieland group into the score? Carefully! To that end, Sammy (full name Sammy Dechenne) and I have worked out a cue sheet that identifies when and where his group will play, and what kind of music will work. And in some places, I'll take over with just keyboard. I think we've come up with an effective balance, and also a plan that will help Lloyd's great film come to life on Sunday afternoon. Please join us and see what you think! See you on Sunday at the Somerville!